This review is coming to you quite a bit after the fact and I'm well aware of it, but this concert was right in the middle of my vacation and I had planned all along to unplug and relax as much as possible during my time away. Now that I've been back home for over a week and have readjusted to the normal everyday routine of life, I'm back in the saddle (desk chair?) and ready to write, so here it is! Earlier in the week of August 14th, my wife and I took our kids to see the Red Sox play the Arizona Diamondbacks at Fenway Park. We had also invited my uncle and cousin so we met them there to enjoy a Sunday afternoon at the ballpark. It was the Sox' final home game before a long road trip and the first time our kids had been to a Major League Baseball game. They loved it and we had a great time, even though it happened to be the hottest afternoon of the week, 95 oF and humid and with the heat index the "real feel" air temp was 105 oF! A few days after the game, Mrs. Chemist and I left the kids with my parents and drove back into Boston. For this occasion, we had booked a hotel room in advance so that we could stay in the city after the concert instead of driving back late at night; it would also be the first time since we starting having our kids almost twelve years ago that we'd ever had an overnight on our own, so we were really looking forward to it. After parking the car and checking into our great hotel (shout out to the Newbury Guest House...we'll definitely be back! ), we decided to stroll around and grab some dinner before hopping the T to Kenmore Square. As soon as we got up to street level at Kenmore, it was predictably mobbed with people trying to make their way the two blocks to Fenway Park, as well as people trying to scalp tickets and T-shirts. I was even offered an "intense sideburn discount" for one of the shirts...I guess he liked my 'burns! Once we got inside the park, we made our way to our seats. I had known from buying the tickets back in January that the seats were to the side of the stage and, knowing the funky angles of Fenway Park from all of the baseball games I've seen there, was a bit worried that the view wouldn't be good, but they turned out to be very nice seats. We were up above the field on the wall about halfway between third base and the Green Monster, and at the end of a row so we had a clear view of everything. The concert was set to start at 7:30pm and we were in our seats by 7pm, but it didn't actually start until close to 8:15pm. In the meantime, we ended up speaking to two very nice ladies sitting next to us who had seen Billy in concert over a dozen times. Finally, the lights went out and some classical music was played over the PA system as Billy and his band took to the stage. After sitting down at his piano, it was time to get started! Seeing as we were all in the oldest ballpark in the country, they started the concert off with "Take Me Out to the Ballgame" before setting things off with a bang with the rapid-fire piano intro to "Prelude/Angry Young Man." The sound mix was pretty good although, surprisingly for an outdoor concert it was a little shrill and tinny on the ears. Overall a nice mix, but Billy's vocals were a bit too low and his piano a bit too high such that it got lost in the other high frequencies (cymbals, guitars) sometimes. One of the great things about his set lists is that while he has a core set of songs that he plays at every show, he mixes up the rest a LOT, pulling lots of deep album cuts and rarities into the set making each show quite different. After the opener and an excellent "Pressure," they did the first half of "Dirty Water" in honor of being at the Red Sox' home field, although Billy admitted that as a Yankees fan (to which he got some good-natured booing), he didn't know the rest! Before "Big Man on Mulberry Street" he announced that "this wasn't a hit single, so if you want to go to the bathrooms now would be a good time!" A recurring theme throughout the night was his very humorous (and oftentimes self-deprecating) banter...very off-the-cuff and real, and very funny! Throughout the show, he kept swatting at the bugs attracted to the bright stage lights with a flyswatter, many times in perfect time during songs without missing a beat. During one break between songs, he mentioned how he hasn't "had a record in the charts in 23 years...and here I am playing baseball stadiums at 67!" This drew loud and appreciative cheers and was a nice acknowledgment that his fantastic body of work has stood the test of time and continues to do so. He did a quick audience vote for either "Summer, Highland Falls" or "Vienna" and while I love both songs, the crowd overwhelmingly voted for "Vienna" which was fine with me as it's one of my favorite songs of his. For the instrumental "Root Beer Rag," which is a showcase for Billy's piano playing, he brought up "a local Boston musician...Bradley Bartlett, the Boston Piano Kid!" Bradley is only 13 years old, but he sat down at a piano that had been set up opposite Billy's and proceeded to play the song along with Billy note for note. The sellout crowd and loud cheers didn't seem to phase him one bit and he had the biggest smile on his face once the song was done and he got a standing ovation...a very cool moment! A pair of New York-centric songs followed and were excellent, although I wonder if anyone else who was there noticed the pockets of cheers after Billy sang the line in "Miami 2017" where they "threw the Yankees in for free!" I grinned to myself at that one. "And So it Goes" was Billy alone at the piano and was just beautiful, while the crowd singing along to "She's Always a Woman" so impressed him that he gave us a big compliment after the song ended. Guitarist Mike Delguidice sang lead on "Sweet Caroline," a Neil Diamond cover that is played near the end of Red Sox games at Fenway Park. Personally, it's one of the new "traditions" over the last decade that as a longtime Red Sox fan (i.e. one who actually remembers what it was like for many years before 2004) that I loathe, but I duly stood up with the rest of the crowd and half-heartedly made the right motions and hollers at the appropriate times. Mike also sang a short Puccini opera song (in impeccable Italian) as a lead in to one of my favorite songs, "Scenes From an Italian Restaurant." For the set closer, as soon as Billy put the harmonica around his neck we all knew what was coming, and I think every single person present sang every word to "Piano Man." 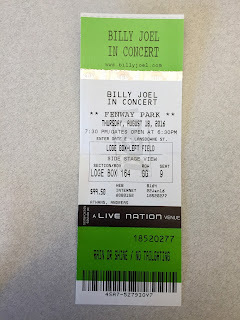 Before the band came back onstage for the encores, my wife turned to me and said she hoped she'd hear one of her two favorite Billy Joel songs, "We Didn't Start the Fire" or "Uptown Girl." Coincidentally, he led off the encore section with those two songs! Neither she nor I had looked at any of his previous set lists online before the show, so to say that was an eerie coincidence would be totally appropriate. He played rhythm guitar for the first song, while for the next couple of songs, Billy sang at the front of the stage and worked the mic stand like a 1960s rock and roll pro. The concert was brought to a close with "Only the Good Die Young"...the band went off stage, the lights came on, and the concert was over to thunderous applause and appreciative hollering. They threw a couple of covers into other songs during the set ("Heatwave" in the middle of "River of Dreams" and Led Zeppelin's "Rock and Roll" in the middle of "You May Be Right") and delivered a powerhouse (and fun!) performance from beginning to end. The horn section was so nice to hear, as many of Billy's songs are very heavy on the horns and most bands these days try to mimic those parts with synthesizers (*cough* Paul McCartney *cough*). The entire group was tight and locked in, and you could really tell they were having a blast playing those songs with each other. Billy spent the vast majority of the show behind his piano, which was on a rotating swivel at the front of the stage so that he could spend portions of the show looking at each side of the crowd, as well as dead center. His voice was clear and strong, the result of him wisely lowering the keys to his songs as he's aged in order to compensate for its deepening. We left the concert absolutely blown away by Billy's energy, musicianship, and humor. It was one of the best concerts I've ever been to and I will definitely go see him again if given the chance. He played for over two hours and the range of material from his entire career that they played made it very hard for me to imagine anyone leaving dissatisfied. One thing I noticed right away both at the concert as well as on the T back to the hotel was the cross-section of ages and backgrounds we saw at the show: men and women of different races, ranging in age from Baby Boomers to teenagers and everything in between, all enjoying the show. I heard kids barely in their 20s on the subway after the show talking about how great it was, and it's nice to see how much of a late-career critical renaissance Billy has gotten after being dismissed by a lot of the more smug critics during his heyday of million-selling albums and chart-topping singles in the 1970s and 80s. After getting off at our stop, we walked the few blocks to our hotel in the still-muggy night. It took a while for us to relax and decompress from how great the concert was, but after managing to get to sleep, Mrs. Chemist and I woke up early and spent the next day enjoying Boston, just the two of us, before heading back to my parents' house and our kids. It was great to combine a mini-overnight vacation with my wife with the concert, and it was definitely worth waiting eight months after buying tickets to see Billy. He may have stopped writing, recording, and releasing new music but he is still an incredible musician and performer and with that body of work to his credit, he has more than enough to draw on to make every show a worthwhile and fantastic experience. If you haven't seen Billy live, I recommend it...you won't be disappointed! This week marks my return from the long, relaxing, and much-needed vacation I took with my family, and my return to the real world of the daily work grind, kids in school and on sports teams, and normal everyday life. While I was away, I purposely avoided checking my work email, answering work-related phone calls and texts, and limited my time online. What this means is that even though I did many things that warrant being written about, I didn't spend a lick of time at the keyboard! Now that I'm getting settled back into the "real world" (or as "real" as it can be at present), I'm also getting back into the writing groove. There's lots for me to write about: book reviews, my review of the Billy Joel concert I went to last week, taking my kids to their first Red Sox game at Fenway Park, thoughts on sports, and more. I hope those of you who enjoy reading some (or all) of my posts can bear with me as I begin to work on all of these...I promise (hope) it'll be worth the wait! It's that time of the year when a nice, long break from the daily grind of work is in order. Unlike most years where I typically take several short 3-4 day breaks over the course of the year, in 2016 I've barely taken any time off. The plan has been to cash in all of my vacation days for an extended break this summer, and while I'm excited that it's finally coming this week, I'm also pretty burned out. More than anything, I'm mentally exhausted from the stresses of work and just need some time away to recharge my batteries, relax, and enjoy time with my family and friends. Mrs. Chemist and I have a lot planned for our time away (including, among other things, taking the kids to their first Red Sox game and seeing Billy Joel in concert) and while I'll continue to write, my posting on here will probably be sporadic (if I even post anything at all while I'm away). However, you can rest assured that I'll write about our trip, the game, and the concert (among other things) when I get back. I've also got lots of ideas for posts that I just need time to flesh out and write, so hopefully the extended break will get the creative juices flowing even more than usual. Here's to coming back more refreshed and focused as the summer comes to an end! "I Thought I Knew You...What Did I Know?" Or perhaps, "I Knew You Then, But Do I Know You Now?" This is a difficult post for me to write, and I'm warning my readers up front that I'm going to be intentionally vague about details in order to protect the people affected, but my world was rocked the other night with some news I got about someone I know. We'd been close friends for almost ten years and were in regular contact, with plans to get our families together in a couple of weeks once I'm on vacation. Then, oddly, I didn't hear from him for a couple of weeks. We'd last communicated on good terms so I had no idea what was going on and began to get concerned that something was wrong. Imagine my surprise when his wife contacted me a week ago to let me know that he was in jail for having a sexual affair with a minor. Needless to say, I was stunned: first, as a husband and father of four (three of whom are my precious daughters) I was appalled by his actions; second, I was thrown for a loop because in all the time I'd known him I never would've expected him to do something like that. My heart goes out to his wife and two children, neither of whom he'll probably ever see again, and I've wiped him out of my life by deleting and blocking him from my phone and social media accounts. While all of this has been a huge shock to me, it's also shaken me regarding my ability to read people. All I've been able to think about it is how he could do such a thing? I'd known the guy for almost a decade and he was one of my closest friends. I never suspected he could or would do anything like this, not in a million years. I thought I knew him but now I'm wondering if I ever really did? Did I only know who he presented to the world while he kept the rest of his true self hidden? It's made me wonder if I'm a poor judge of character, or if I'm too gullible that I fell for it. I also feel the tiniest twinge of guilt over cutting someone who was such a close friend out of my life so wholly and suddenly, but I then remind myself that he did that to himself and that what he did was so heinous that I can never have anyone who is capable of that in my life in any capacity. I have a nagging fear that he'll try to contact me when he gets out on bail (which is only happening after he gets fitted with a tracking ankle bracelet) since we haven't spoken in almost a while and we were supposed to meet up later this month. I've blocked him from my phone and social media and if he does try to get in touch, I'm just going to ignore it, but it's a situation I hope I won't be in in the first place. Finally, it's set my mind racing as to whether anyone else I know has something so horrifying as this hidden within them. However, I am refusing to let this prevent me from trusting wholeheartedly in the rest of the people in my mind who haven't given me a reason not to. Basically, this entire thing has really knocked me sideways and I'm still coming to terms with it, not only in terms of sympathy for the victims, but all of the anger, disappointment, horror, and confusion it's wrought in me. I plan on following the case as it's reported on in the papers and I don't feel any remorse in hoping for a just and severe punishment. Some things are simply beyond the pale regardless of how close you once were (or thought you were) to someone. Among the numerous books about Pink Floyd that I've written about on this site, there was one I reviewed a short while back called Echoes which was subtitled "the complete history of Pink Floyd." It was a thorough day-by-day chronicle of the band's entire existence from the birth of the band members in early 1940s through 2006. It was a chronological record of every recording session, live concert, TV and radio appearance, and record release over the course of forty years and ranks alongside similar books on the Beatles and Kinks as essential tomes for fans of those bands. However, I became aware of a new book called The Complete Pink Floyd from a publisher I was working with on another book; they asked me if I'd be interested and I of course said yes. It's brand new (published in 2016) and by the same author: renowned Pink Floyd expert Glenn Povey. At first glance it looked much the same as Echoes, although much thicker. What, if any, were the differences between the two books? That's what I set out to discover and I'll convey my findings in this review. The first thing I should note is that I was sent a copy of the UK edition of the book...the US edition is the same in every way except for different cover art. Second, from the moment I opened the book it was clear that this is really an updated and revised edition of Echoes. In fact, with the death of Richard Wright in 2008 since the publication of Echoes and the final non-archival releases from Pink Floyd in the interim (2014's The Endless River), The Complete Pink Floyd can be seen more as the final edition of the book. It goes up to the end of 2015 and so includes the additional Pink Floyd reissues and releases since 2006, as well as additional solo releases and live concert appearances from Roger Waters, David Gilmour, Nick Mason, and Richard Wright in the interim. The layout of the book is the same as in Echoes, with each chapter devoted to a year or cluster of years/era from the band's career. Within each chapter, the first several pages are devoted to a write-up describing their activities during that time; after this is the day-by-day diary section describing everything they did during that period. The chapters are accompanied by lots of photographs of the band during those specific eras, as well as various memorabilia, mainly concert posters/flyers and ticket stubs. Many of the entries for concerts include contemporary press reports and reviews to give an idea of how their albums and concerts were received at the time; this is especially beneficial when comparing with the retrospective views on much of their work. Where this updated and expanded edition really shines is in documenting their recording sessions, especially during the early years through their mid-career (~1975). With unprecedented access to the Abbey Road Studios archives, Povey is able to give the most detailed analysis yet of their recording career, detailing every take, edit piece, alternate/working title, and unreleased song they ever worked on. There are even some songs that were lost forever which are finally chronicled. While after a while it all becomes a bit repetitive, it's still very nice to have all of this information at one's fingertips and in one volume. While this book doesn't really lend itself to front-to-back reading, I did just that the very first time in order to make sure I didn't miss anything. However, this is a book that is best enjoyed when being used as a reference guide for serious fans. Overall, as Echoes was, it's an excellent book although I do have a few criticisms. First, while the photographs are wonderful, there are many nice ones from the previous edition that are now missing (most notably, a shot of Frank Zappa onstage with Pink Floyd in 1969). Second, the narrative write-ups that lead off each chapter are really nice, but large chunks of them are repeated word-for-word during the sections that detail each album and single release; this just seems a bit lazy, but is only a minor criticism. 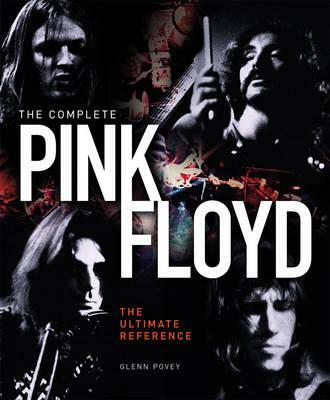 The remainder of the book has extensive discographies of Pink Floyd, as well as the various members' solo releases and is an invaluable guide for any collector or fan. In all, this is the final word on Pink Floyd's day-to-day career and truly lives up to its subtitle as "the ultimate reference." If you're a serious Floyd fan, you need this book.